As we enter UK Kidney Week 2014, Richard Fluck, National Clinical Director for Renal Disease for NHS England, explains how we can better manage acute kidney injury. Last week I opened the newspapers to find headlines about people dying in NHS hospitals due to thirst. Closer reading of the articles told me two things. First, these were stories about acute kidney injury. Second, there is considerable ignorance in the media, public and professional groups about this very important safety issue. So what is it all about? To understand acute kidney injury we need to know what our kidneys do, how they go wrong, what happens and why it is so important. People also need to know what the NHS is doing to address the problem. Most people have two kidneys, sitting in our abdomen at the back. Every minute of every day, the kidneys clean our blood through a filtering system producing urine. The kidneys regulate the amount of fluid in our body. Go into a desert and the kidneys will reduce urine production; drink three cups of tea, it will get rid of the excess. The kidneys excrete the toxins our body builds up as part of our metabolism. The kidneys look after our blood and our bones. For people taking drugs it is very common that the drugs are got rid of in the urine. So what happens if the kidneys go wrong? The first thing to say is that someone might not notice at the early stages. There is no pain and there are no symptoms. Acute kidney injury comes on quickly – hours or days – and during those early stages blood tests are the best way to pick up a problem. Understanding the function of our kidneys allows us to know what might happen when they go wrong. For acute kidney injury that means the body does not correctly regulate the fluid levels, does not get rid of toxins so well and drugs may accumulate in the body. As the situation worsens this can have serious consequences. So what causes acute kidney injury? In simple terms, there are three ways in which the kidney function may be affected. Reduce the blood supply, block the urine production and rarely, problems directly within the kidney itself. Dehydration may affect kidney function but rarely as the only cause. The commonest associations with acute kidney injury are serious infections (pneumonia, blood poisoning), heart problems and blockages of the urinary tract (for example prostate problems). In many cases, the drugs that someone has been taking to deal with another medical issue can then also add to the problem and affect the kidneys. So acute kidney injury happens in people who often have an underlying long term medical problem, become unwell and develop acute kidney injury as an important complication of the overall problem. So how common is this? We only have estimates of how common the problem is. It seems to be getting more common and it is a global problem, probably as people have more complex medical needs. It is estimated that between one in ten and one in five of emergency admissions have acute kidney injury as well as the underlying medical problem that bring them to hospital. About two thirds of those start in the community and a third arise after someone is admitted. The risk of death is high but largely related to the underlying medical emergency. What is clear is that having acute kidney injury on top of the other problem increases the risk of dying and keeps people in hospital longer, delaying recovery. So acute kidney injury is an important marker of illness severity as well as informing professionals about how someone needs to be looked after. NHS England has brought together a group of patients and professionals to improve the care of people who get acute kidney injury. We need to help the public, patients and professionals understand the issue and we need to support the NHS in measuring the impact of acute kidney injury on individuals and the population. It is not as simple as making sure everyone has enough fluids, although that is important, but the needs are simple. We need to identify people who are at risk, monitor them appropriately, diagnose the problem early and provide reliable and consistent treatment to everyone. As a national health service, we need to measure the scale of the problem and identify those teams that are doing a good job so that everyone can benefit. As a first step, this summer, the Keeping Kidneys Healthy project will provide the leadership to introduce a national system of measurement across the NHS in England. This will improve the early diagnosis, benefiting patients, carers and the teams that help care for them, supporting better outcomes. It will also allow NHS England and other organisations to count how much acute kidney injury is occurring and support the drive to reduce the avoidable harm acute kidney injury inflicts on people, their families and on health care. In doing so, the NHS will be the first national health system to have tackled this global problem. Acute kidney injury is common and harmful, but it can be dealt with better. Not all episodes can be prevented but the NHS has the potential to be the safest health care system in the world and this work is a major part of it, reducing avoidable harm. The mantra is simple – measure, educate and manage better. Richard Fluck is National Clinical Director for Renal Disease for NHS England. In 1996 Richard took up post at Derby City Hospital as a single handed nephrologist. Over the next decade, the department expanded and developed a strong clinical research and safety programme. As a whole, the department has interests in cardiovascular consequences of CKD and dialysis, infection and vascular access. As part of the team, he is involved in the coordination of two cohort studies looking at chronic kidney disease in primary care (RRID) and the short and long term consequences of acute kidney injury (ARID). More recent projects include the development of PROMs for renal patients and developing home therapies for patients on dialysis. Within the acute trust he has been clinical lead for renal disease for 15 years and clinical director for medicine. 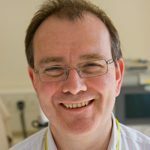 He has been the clinical lead for the East Midlands Renal Network and worked with the DH and HPA on infection in renal disease. He was also the clinical lead for the Kidney Care National audit on vascular access and transport in the haemodialysis population. Are there – or will there be – opportunities for patient/public involvement in the AKI programme, nationally/regionally/locally? I’m an elected public Governor at Western Sussex Hospitals NHSFT, a member of SECSCN Advisory Groups on Cancer and on Stroke, and a member of Sussex Vascular and Trauma ODNs etc.